The day Qualcomm announced the Snapdragon 855 processor, OnePlus announced that the company would be among the first to launch a phone powered by this chipset. Now, looking at company’s record, we see one of the two flagships from OnePlus launching in Q2 every year. But this time, there are chances that OnePlus will launch its 2019’s flagship pretty early than expected. Carl Pei has announced that OnePlus will launch a 5G smartphone in early 2019 which might be a phone under a completely new series. Or maybe it’s going to the OnePlus 7. Whatever the case it, we got our very first look at the design of next flagship from the company today. Is this how OnePlus 7 is going to look like? 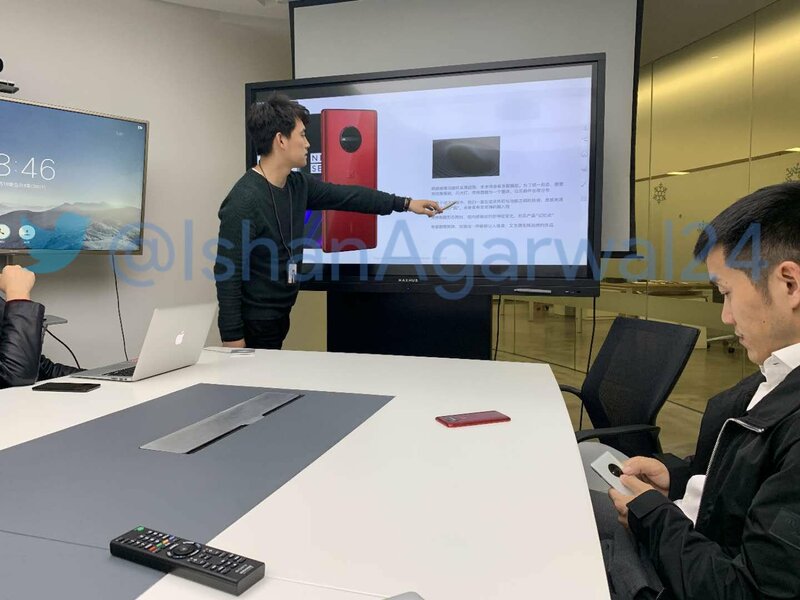 A photograph was taken in an internal meeting of OnePlus & it shows a couple of company’s employees along with the company’s CEO Pete Lau, discussing the design of next OnePlus flagship. One of the major design changes that we see is that big circular camera module on the rear. The Megapixels war has started again as we already have phones like the Huawei Nova 4 and the Honor V20 with a 48MP rear sensor. Xiaomi is also launching a phone with a 48MP rear camera next year so OnePlus might also do the same. That circular camera module on the rear may remind you of the Nokia Lumia 1020, which was one of the most interesting phones when it launched in 2013. It had an impressive 41MP sensor on the back. As shown in the image above, the alleged OnePlus 7 (or whatever the name is going to be) in the slide is in red but there is also a model in white color that Pete Lau is holding in the image. Both the red and white variants have a black camera module. Well, we cannot say if this is going to be the final design of OnePlus’ next flagship. Still, it is good to see OnePlus going with different designs for its flagships every year.